Blue food is a rare occurrence in nature. There are no leafy blue vegetables (blue lettuce? ), no blue meats (blueburger, well-done please), and aside from blueberries and a few blue-purple potatoes from remote spots on the globe, blue just doesn’t exist in any significant quantity as a natural food color. Since we have already learned about Mozzarella cheese, I thought I would do something different for this week’s cheese lesson. I present to you 10 Cheesy Facts About the Mozzarella Cheese That Came From Italy. 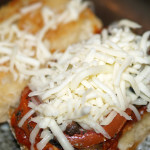 #1: Mozzarella cheese is produced from milk obtained through cows or water buffalos. It originated in Italy. #2: In general, the color of fresh mozzarella cheese is white, but it may occasionally be slightly yellow, depending on the animal’s diet. #3: Mozzarella cheese contains high amounts of moisture, so it’s important that it’s eaten fairly quickly after it’s made. #4: The most common use of Mozzarella cheese is on pizzas and lasagna. #5: Mozzarella cheese is often rolled up into balls of 80 to 100 grams. #6: One popular variation of Mozzarella cheese is known as “stuffed Mozzarella.” This is a piece of Mozzarella cheese that has been stuffed with olives, ham and tomatoes. #7: The word “Mozzarella” was first discovered in 1570 in a cookbook by Bartolomeo Scappi. #8: A 100 gram ball of Mozzarella cheese contains 22 grams of protein and 22 grams of fat. 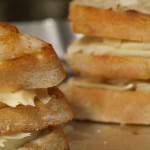 #9: Mozzarella cheese with a low moisture content can be refrigerated for up to one month before it starts turning bad. #10: Mozzarella cheese is better for use on lasagna when it has been partially dried. 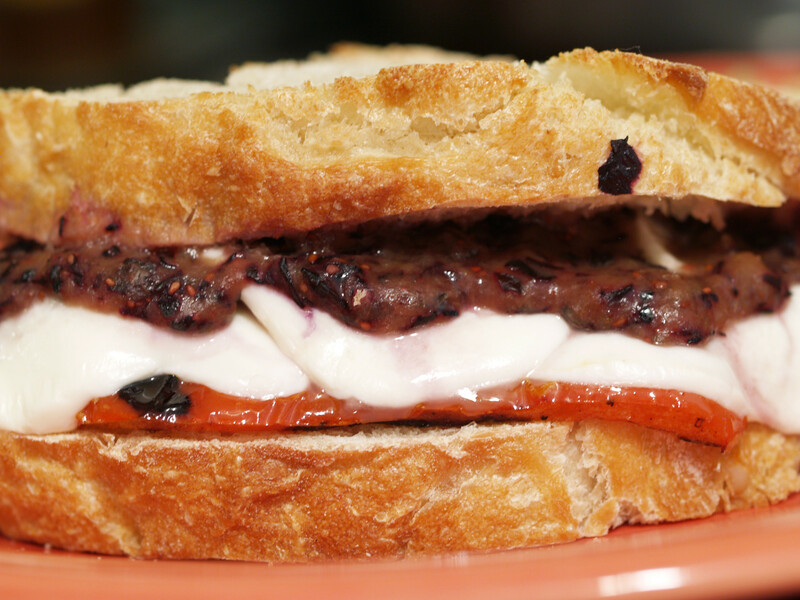 The Mozzarella cheese used in tonight’s grilled cheese sandwich was a nice, simple cheese that worked well by staying in the background, which let the blueberries and peppers move to the front. I was able to choose my red ingredient right away, red pepper, and my white ingredient, Mozzarella cheese, but the blue ingredient really caught me off guard. As some of you may know, my favorite color is blue so it was somewhat disheartening to learn that there are only a small amount of blue ingredients. The main one of course, has the color in its name, so I had to go with that one: blueberries. (Even if they are somewhat purple/black as well.) I have not really indulged in many blueberries in my life so this was an interesting experiment for me. I am all for trying something new, especially when it is something as common as blueberries. I mixed up the small package of blueberries in a blender and only added a small bit of olive oil and voila, blueberry mixture. I am not sure I even needed the olive oil, but it seemed to turn out great. It was sweet and tasty. The blueberries had a nice tart taste to it that worked well on the grilled cheese. I also grilled the red peppers in a pan of olive oil, salt and pepper until I could see the grill marks. That was really it for the preparation of tonight’s grilled cheese. Simple but good, in my opinion. I did not want to do anything too fancy since I had two main ingredients in the peppers and blueberries. 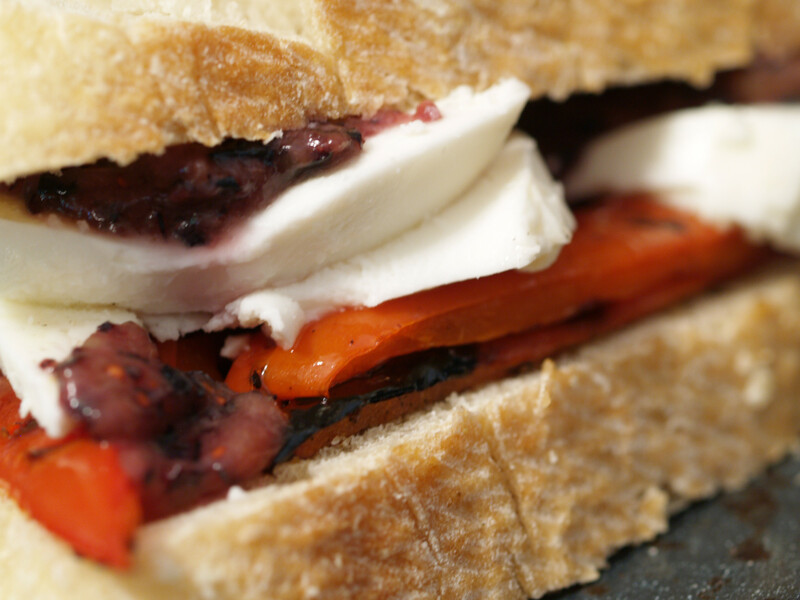 Finally, in order to keep my patriotic theme going, I placed the red peppers on the bread first, followed by the Mozzarella cheese and then finally the blueberry mixture. I could have gone the other way, but putting the sauce on the bottom would not have worked as well, in my opinion. This grilled cheese reminds me of one of my favorite sandwiches, my Valentine’s Day Strawberry/Mango grilled cheese sandwich, as both grilled cheeses had fruit mixtures (strawberry/mango vs blueberry). That grilled cheese I loved, as it was a great one, while on the other hand, I only liked tonight’s grilled cheese. As seems to be the theme lately, my sandwiches have been good but have not really crossed the threshold of great. 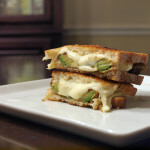 Maybe I am being too hard on myself, but as I create more of these wonderful grilled cheese, I have more to compare to. Depending on the bite, I could really taste the blueberry mixture or really taste the red peppers. Unfortunately, I do not think that the flavors blended well together, they only competed with each other. The bread was great and one that I have used before. And you can never go wrong with Mozzarella cheese. I am just unsure of the combination of red peppers and blueberries. If you have any suggestions on what other red ingredient you might have used, instead of strawberries since I already used them, please leave them in the comment section below. I would love to hear them, especially if I revisit this recipe for July 4th. I didn’t say it earlier, but I should definitely it say it here: Thank you veterans, those that are with us and those that are not, for all that you have done to help keep this country and world safe. I greatly admire everything you have done and everything you will do. Thanks! I am not sure how to transition from that to wrapping up my grilled cheese, so I apologize. Let me just say that tonight’s sandwich might have been better if I went either the red pepper or blueberry route, not both. I just think they didn’t work as well together as I would have hoped. Not bad, just not great. Here is to next week’s sandwich! 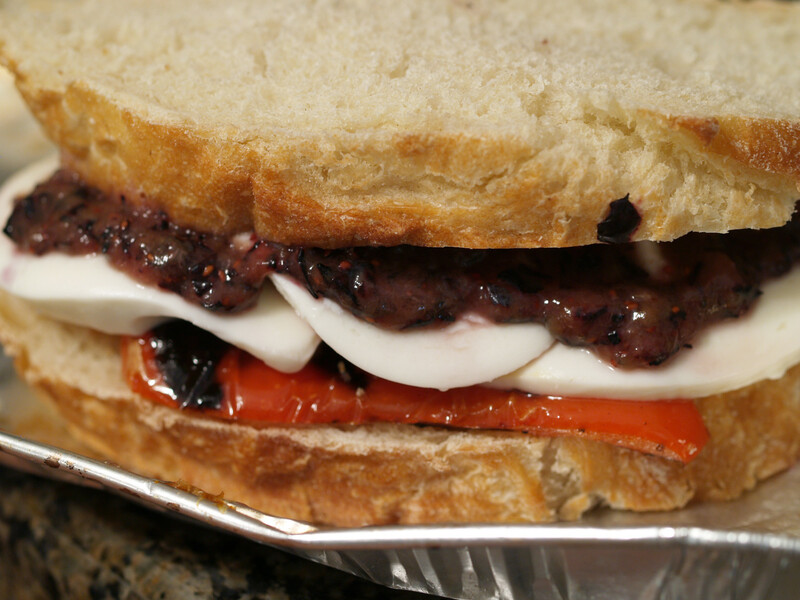 Posted in Grilled Cheese and tagged A Minus B Plus, baked, blueberries, mozzarella, red peppers, semolina. Very patriotic, Shane! This looks surprisingly yummy! I see from your grade that it was delish! I can’t wait to try one of your creations! What an interesting creation! 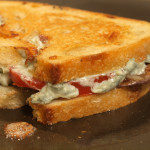 I would’ve never thought that blue berries would go well in a grilled cheese sandwich but I may have to give it a try. I loved your info on mozzarella, it is without a doubt my most favorite cheese and just may be my favorite thing to eat period. I especially love buffalo mozzarella. Because of the cost I don’t have it very often but it is certainly a treat when I do. @ greg: I saw/read all about your travels and meet-ups! I hope you had a great time! I am glad that you find something “clever” to keep you coming back! 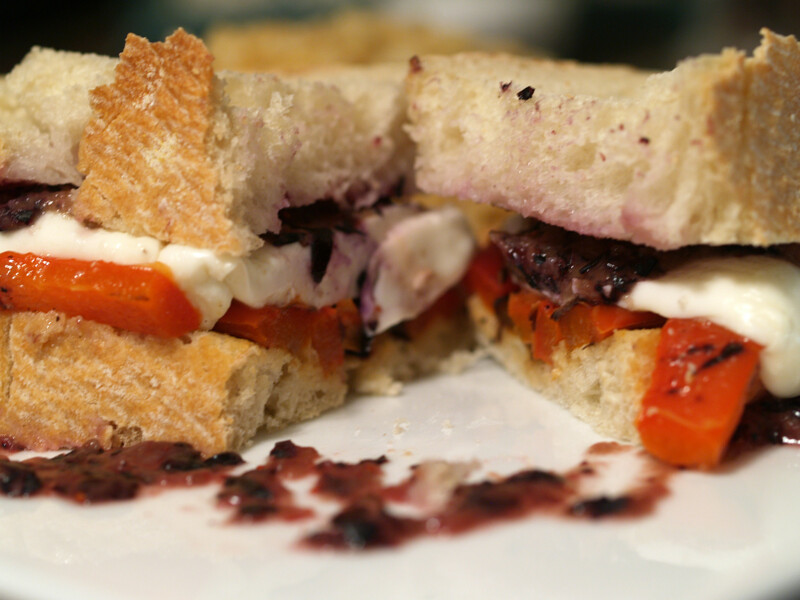 The blueberries added something nice to the sandwich, will be interesting to use them on a different type of sandwich. Just earlier, for a quick bite, I put some mozzarella on some of the leftover bread, toasted it and then added some Italian seasoning and garlic powder. It is very yummy! Maybe steak for a red ingredient? (Does that count as red?) And make a sort of blueberry bbq sauce of some sort? @ Mish: Thanks so much for stopping by! Sorry for the delay in replying. I think If you went with a meat product, especially a steak, you would be moving away from a grilled cheese sandwich and more to a steak sandwich. It is an interesting thought though! 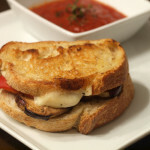 I think a blueberry bbq sauce does sound great and would probably go well with a whole host of things, including this grilled cheese sandwich. I will have to think of using it in a future sandwich.